The temple observes the Aaru Kala Puja system – six time pujas a day - as per Shivagama rules. Vinayaka Chaturthi in August-September; Navarathri in September-October; Karthikai Deepam in November-December; Masi Magam and Shivrathri in February-March and Pradosha pujas are devotionally observed in the temple. 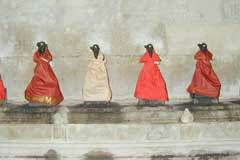 In the inner space behind the Shivalinga, Lord Shanmugha Natha appears with five heads accompanied by His consorts Valli and Deivanai facing east. 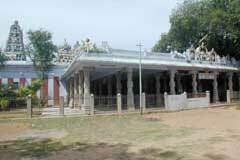 This is the only temple in India in Pattamangalam with Lord Dakshinamurthy facing east. 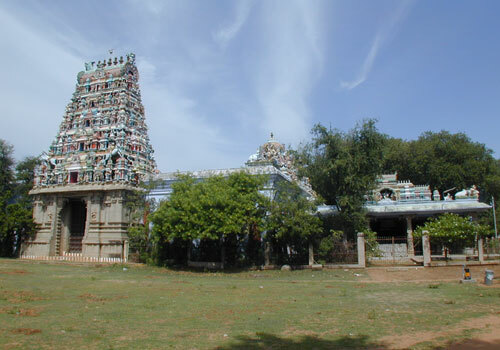 Sri Pattamangalam Dakshinamurthy Temple, Pattamangalam, Sivaganga district. + 91-4577- 262 023, 97863 09236, 99621 21462. Devotees circumambulate the temple thrice to realize their wish, 5 times to succeed in efforts, 7 times to become noble and develop high ideals and peace of mind, 9 for a child, 11 for longevity, 15 for prosperity and 1008 times to win in love affairs and get the girl of their choice. 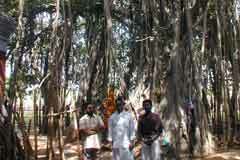 People circumambulate the shrine of Lord Dakshinamurthy and the banyan tree 108 times to make their life happier without any evil remaining or peeping again and blessed with all wishes, children and prosperity. Usual abishek and aaradhanas and vastras are offered to Lord. 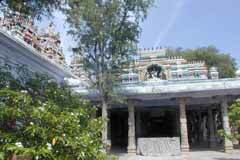 The temple has the Banyan tree as the sthala vruksha and the sacred tank is Pottramarai as in Mother Meenakshi temple in Madurai. 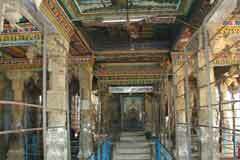 Lord Dakshinamurthy shrine is outside the temple separately. Lord Dakshinamurthy graces here sitting in a Veerasana posture, smiling, fair in complexion, wearing crescent moon and kondrai flower, holding Agni in the upper right hand, Gnana Mudra in the lower right hand, a serpent in the left upper hand and placing the lower left hand on His lap. Lord Vishnu graces as a Varaha-Swine one of His avatars is AvatarsHand Lord Brahamma as a swan. 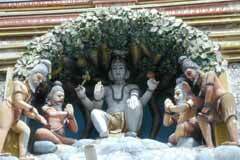 Lord was telling Shiva stories to sage Brungi and Nandi Deva. Kruthika maidens – Nidardani, Aparakendi, Dekanthi, Vardhayendhi, Amba and Thula came there and begged Lord that they too may be gifted with the Ashtama Siddhi art. Lord Shiva was reluctant. Mother Umadevi recommended favouring the Kruthika maidens. But the maidens did not listen to the teaching, their attention elsewhere, thus lost a golden opportunity of learning this rare art. Angry Shiva cursed them to become rocks in Pattamangalam. The maidens fell at His feet and sought a relief from the curse. 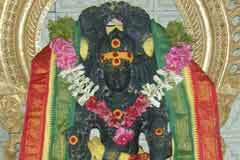 Lord said that they would be rocks for 1000 years and He would come there from Madurai and grant the relief. The relief came in time at Pattamangai. Now the place is known as Pattamangalam. While cursing the maidens, Lord also cursed Mother Uma for Her recommendation then to the undeserved. She is gracing in the temple as Navayadi Kali. After a severe penance, Mother too was relieved of Her curse. She appears now with all smiles. In the inner space behind Lord Shiva in the sanctum sanctorum, Lord Muruga as Shanmuganatha with five heads accompanied His consorts Valli and Deivanai blesses the devotees. 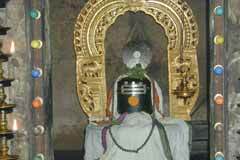 Miracle Based: In the inner space behind the Shivalinga, Lord Shanmugha Natha appears with five heads accompanied by His consorts Valli and Deivanai facing east. This is the only temple in India in Pattamangalam with Lord Dakshinamurthy facing east. Pattamangalam is just 8 km from Sivaganga and Tirupathur. Buses are available from Tirupathur every 30 minutes.